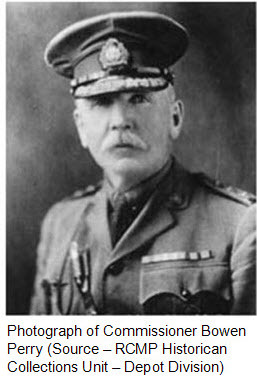 Since 1917, Commissioner Bowen Perry had continued to promote the suggestion that the members of the Force should be permitted to form and send a cavalry regiment to the Canadian Expeditionary Force. 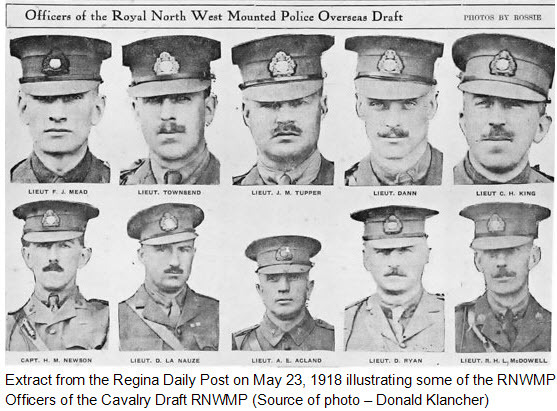 Finally on April 6, 1918, the Canadian government announced their approval for the RNWMP to commence the recruiting for a Cavalry Draft to be sent to the western front. This draft would consist of Force members and individuals recruited from Western Canada. “Order From Ottawa Permits R.N.W.M.P. To enlist For Cavalry Service Overseas –A special order has come from Ottawa to the Mounted Police authorities permitting the members of the Force to enlist in the cavalry for service overseas. The men, it was stated, will be enrolled in the cavalry and attached for the present to the Fort Garry Horse Depot at Winnipeg. The men are being called in from various detachments and will all be examined at the depots throughout the west, after which those it for active service as troopers will be sent to Winnipeg. Some of the prominent citizens of Regina got in touch with the Ottawa authorities to try to effect what is believed to be the general desire of every westerner the preservation of the identity of the Fore as a unit in the fighting lines, it was suggested that should not be enough men of the fore available to form a complete unit that men be enlisted right away in the cavalry division and attached to the force, thus enabling it to go overseas at full strength and with a special mark of distinction, in order to preserve at least some of the sentiment which has surrounded the famous body of men during the past 35 years in the northwest. On April 13, 1918, Commissioner Bowen Perry and Assistant Commissioner James Wilson (O.64) announced their premature retirement in protest against the government decision not to form a RNWMP regiment. Instead the government would send the cavalry draft members to backfill various Canadian cavalry regiments on the western front. “Both Commissioner Perry and Assist. Commissioner Wilson of R.N.W.M.P. Have Resigned: Commissioner Wired Resignation To Ottawa On Wednesday And Notified Staff Later – Understand action was taken because famous Riders are not being sent overseas as unit. Over a year ago, the Force was offered as a unit by the federal government, and accepted by the British authorities. Red tape, of the government variety, it is said was responsible for dilly-dallying and the change in the pre-arranged plans. 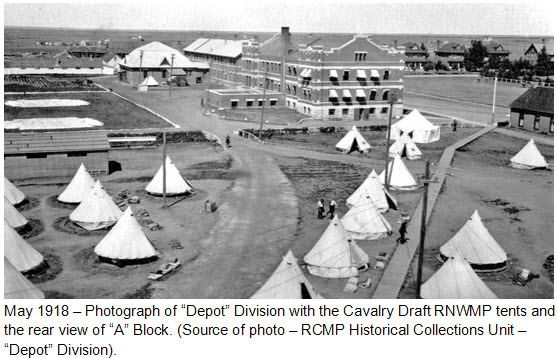 “Mounted Police Barracks May Go To Military Use: One of the expected results from Disbandment of Famous Force – Speculation has been rife among military men in the city during the past few days with regards to the Mounted Police being sent to Winnipeg as a draft for the Fort Garry Horse, said has given rise to rumours which, to some degree are based on reasonable foundation. One of the most persistent of such in the disposition of the barracks of the Mounted Police force, and dame rumor says this will become the headquarters of the military district. Military men here know little or nothing about it and state it is but a rumor, but admit it would make a splendid headquarters for this district, where splendid barracks would be at the disposal of the men recruited, and also room might be found for more of the divisions of the military establishment may now located in quarters I the city. Without much announcement, Commissioner Perry and Assistant Commissioner James Wilson both withdrew their retirement announcements. It would appear that the government provided a commitment to push for the establishment of a RNWMP Squadron to serve on the western front. 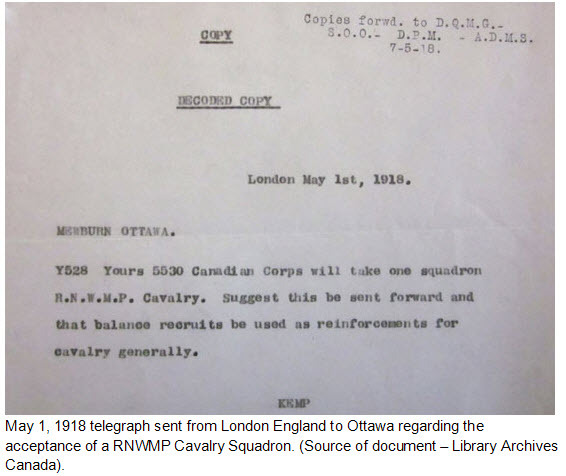 On May 3, 1918, Brigade General R. Gwynne (for the Adjutant General in Ottawa) forwarded the following message to the Officer Commanding Military District #12. 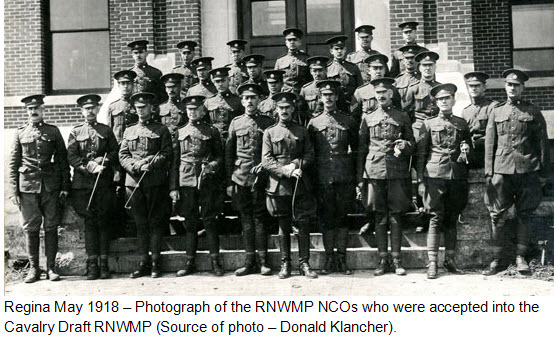 In the covering letter stated – “the General Officer Commanding, Canadian, in France, has arranged to accept a complete squadron of the R.N.W.M.P as a unit in the Canadian Corps” and would later be known as “A” Squadron RNWMP. “MOUNTED POLICE CALLED IN – All N.C.O.s’ and men of the R.N.W.M.P., with the exception of those in the Yukon and the far north land, are being assembled to divisional headquarters here to form a draft for overseas service. It is not yet settled to what unit the men from the famous force will be attached, but the Fort Garry Horse or the Strathcona Horse were virtually a part of the Strathcona Horse regiment at the time of the South Africa war, and that unit is favored for sentimental reasons. While no official word has been received at the barracks, The Post learns that the draft will go overseas under the command of their own officers. It is stated that permission will be granted to a certain number of officers to proceed overseas. It is impossible to forecast the strength of the draft. Those who have been granted permission have volunteered practically to a man, but a certain number are over the age limit, and others, it is stated, will fail on the medical test. On May 13, 1918, the recruitment for the Cavalry Draft had closed. More recruits poured in well beyond the quota allocated before the recruiting could be stopped. A total of 768 applications had been received from both Force members and new recruits. Force members deemed acceptable were 243. The new recruits totaled 495. The Cavalry Draft was organized on a Canadian Cavalry regiment structure consisting of Executive Officers and four cavalry squadrons. All commissioned officers and NCOs would be made up of Force members. Three Sergeant Majors were promoted to the Officer rank (S/M Thomas Irvine, S/M Frederick Mead & S/M Robert MacDowell). 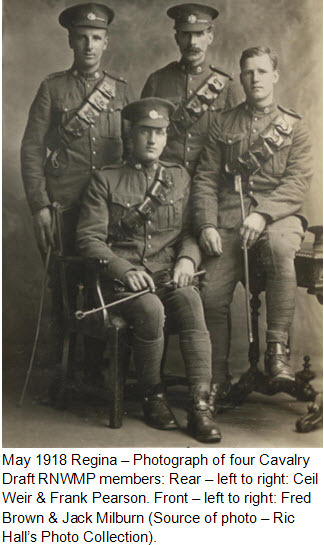 “D” Squadron – Lieuts: Charles King (in command), Arthur Acland & Thomas Irvine. While at “Depot” barracks, members were issued the standard Canadian Expeditionary Force cavalry uniform and kit which were provided by District #12 Militia Stores in Regina. 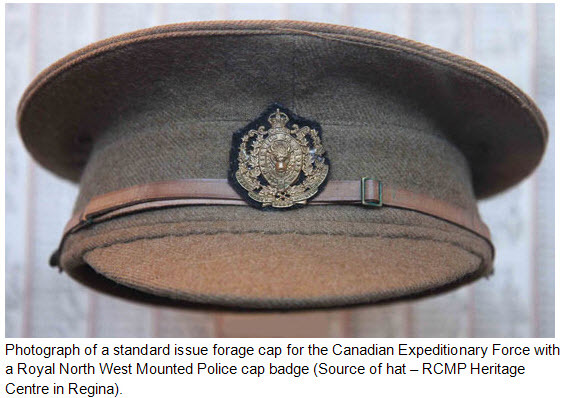 In addition to the above equipment, each member was issued with the standard RNWMP cap badge, collar badges and shoulder titles. The “Depot” Tailor Shop adjusted and altered the new uniforms for each member and RNWMP buttons were sown onto the member’s jackets. 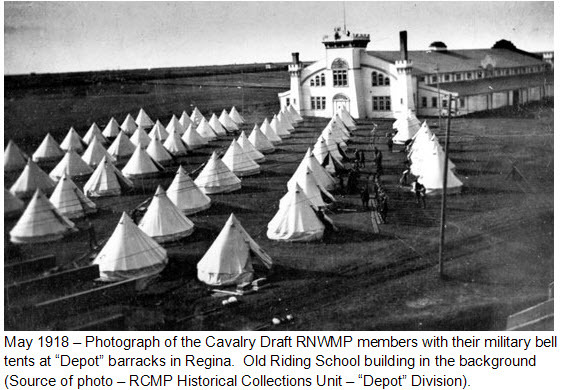 Each applicant for the Cavalry Draft members were sent to the RNWMP “Depot” barracks on the west side of Regina. From May 1st to 15th, 1918, the Draft members were housed at “Depot” barrack in white bell tents. 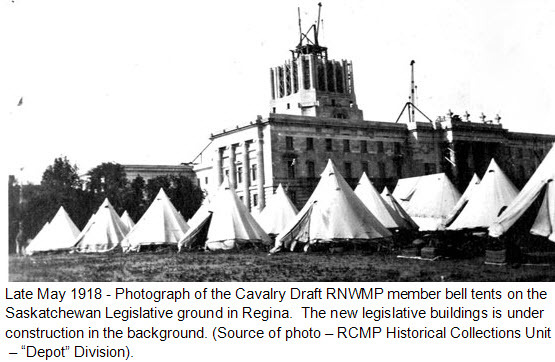 Between May 16 and 30, 1918, the members of the Cavalry Draft were housed in their white bell tents on the grounds of the Saskatchewan legislative grounds. 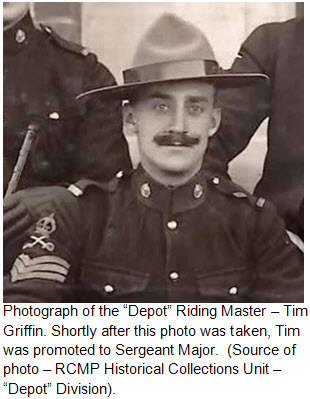 Their mounted and dismounted drill continued daily until the deployment on trains to Montreal. introduced to military structure and fatigues. Each new civilian recruit was issued their own unique Force regimental within the range of #6775 to #7306. “The expression much used as ‘walking on air’ fitted my mood perfectly and I looked forward eagerly to the day I would don the splendid uniform. Full mounted cavalry drill was not provided because there wasn’t enough horses to undertake such training. Draft members would receive the appropriate training when they arrived in England and prior to transferring to the western front. Apparently, Sergeant Major Griffin had a habit of provoking recruits into a situation which resulted in an insubordinate reaction. The riding master would then issue an ultimatum: to meet him behind the stables for a bit of boxing or be charged with insubordination. Many recruits would foolishly select the former. On May 15, 1918, all members of the Cavalry Draft were sworn in as members of the Canadian Expeditionary Force (CEF) and deemed to be on ‘leave of absence’ from the RNWMP until demobilized from the Canadian Expeditionary Force or its return to Canada. With the exception of the officers, all Cavalry Draft members were issued with a CEF service number within the range from 2,683,711 to 2,684,710. On the same day, Cavalry Draft members experienced their first Military Pay Parade which was coordinated by seconded staff from the 5th Regiment Western Cavalry to the Cavalry Draft: Captain Frederick Bagshaw (Paymaster & a barrister prior to joining the CEF); one Sergeant and a Pay Clerk. Fifty-five Draft members failed to meet the physical requirements to serve overseas. As such, they were transferred to the 12th Battalion Canadian Garrison Regiment on May 31, 1918. Jennings, George, “Report On R.N.W.M.P. Overseas Cavalry Draft and R.N.W.M.P. Special Squadron, France” report dated July 7, 1919 – page 1. Disbury Pioneer News on April 24, 1918 – “Mounted Police Want Men” – page 8. Glen, John, “G. Division: A Tale Of The Royal North West Mounted Police.” – page 11. Glen, John, “G. Division: A Tale Of The Royal North West Mounted Police.” – page 15. Glen, John, “G. Division: A Tale Of The Royal North West Mounted Police.” – page 13. Glen, John, “G. Division: A Tale Of The Royal North West Mounted Police.” – page 14. Jennings, George, “Report On R.N.W.M.P. Overseas Cavalry Draft and R.N.W.M.P. Special Squadron, France” report dated July 7, 1919 – page 4.